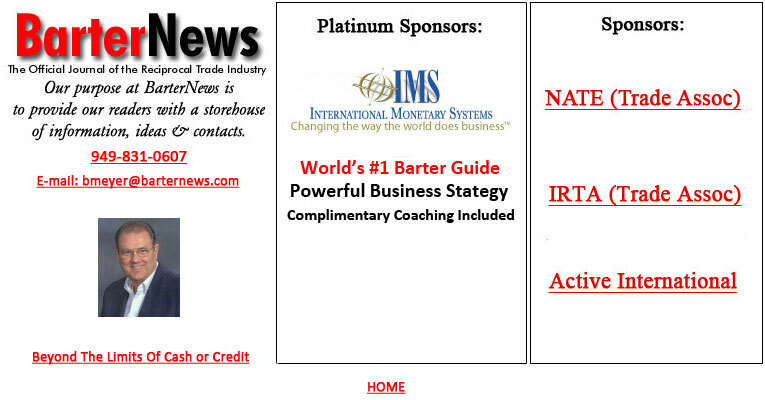 BarterNews Provides Online Editorial For The Worldwide Barter Marketplace. Business and Entrepreneurs Use Barter To Build And Expand Cash Flow. BarterNews magazine, an independently owned and operated publishing company, has been the voice of the industry since 1979. It is written by industry practitioners and is regarded worldwide as the voice of the barter marketplace. The purpose of BarterNews is twofold. First, is to keep you abreast of what's happening by reporting on the changes and evolution of barter�a proven business tool. Second is to show you, through stimulating editorial, how your company can profitably use barter in its many forms to increase your bottomline. 1. For the entrepreneurs and small business owners (companies doing under $10 million in annual gross sales) we report on how barter is done through retail trade exchanges. Typically, trades range from $10 to $10,000. 2. For larger companies there's corporate barter, where domestic trading of goods and services is practiced primarily through AR (accounts receivable) trading. Corporate barter company clients have transactions that are, generally speaking, $500,000 and above with many deals in the millions. 3. Internationally, major corporations, and governments themselves, engage in countertrade where a direct deal begins in the high 6 figures. Worldwide, total transactions are valued at tens of billions of dollars, annually. BarterNews will provide you all of the information you need to move forward confidently in your bartering activity. Herein you can learn more about various forms of trading and the commercial barter industry than anywhere else in the world.